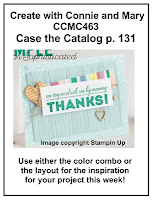 I love the new Crafting Forever and Wood Words stamp sets. 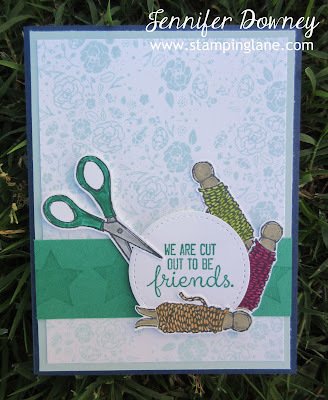 From Wood Words, I stamped the floral image in Soft Sky ink all over for the background and the stars in Versamark across the Emerald Envy card stock. The clothespins each contain a strand of baker's twine in Lemon Lime Twist, Berry Burst and Peekaboo Peach. Behind the stamped piece of Whisper White is a layer of Soft Sky and then a base of Night of Navy that I think helps to anchor the rainbow of colors used on the card. What a fun challenge this week! 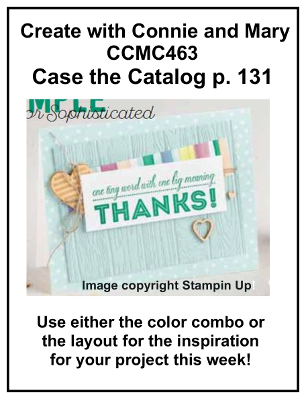 We'd love for you to play along and share your creativity over at Create with Connie and Mary. Happy Stamping! I love that you went against the grain and used the colors this week instead of the sketch! Those little scissors look like they're going to cut right into the circle! Great job!